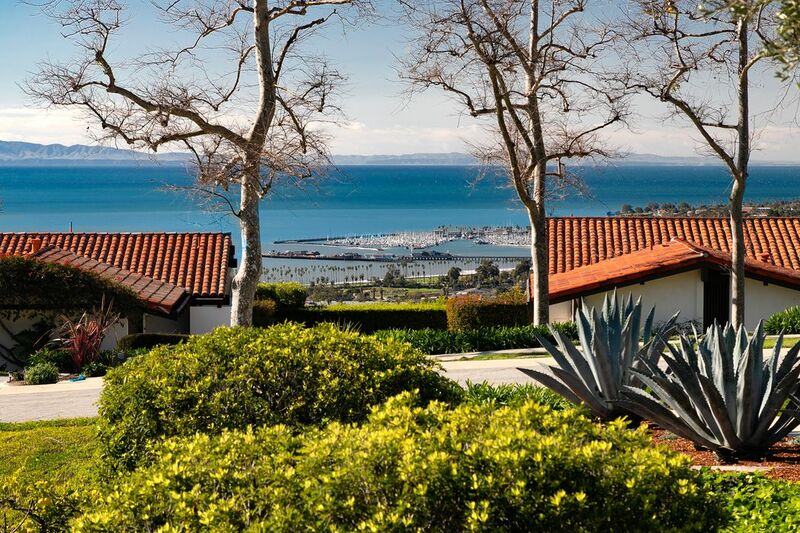 141 Coronada Circle, Santa Barbara, CA 93108 | Sotheby's International Realty, Inc.
$3,250,000 2 Bedrooms2 Full / 1 Partial Baths3,153 sq. ft.
A beautifully remodeled harbor view home in the quiet development of “Villa Coronada” with 2-bedrooms, each with full granite bathrooms, a den and office, top of the line kitchen and inviting patios all wonderfully remodeled and in excellent condition offering extensive amenities along with spectacular ocean, island and harbor views to the south and majestic, panoramic mountain views to the north. Far removed from the Montecito mudflow evacuation zone, one enters Coronada Circle, a quiet broad street with sidewalks and no through traffic. It is shaded by old sycamore trees while unobstructed by overhead utilities. The houses and landscaping are well maintained in Villa Coronada, a Planned Unit Development with a community pool. 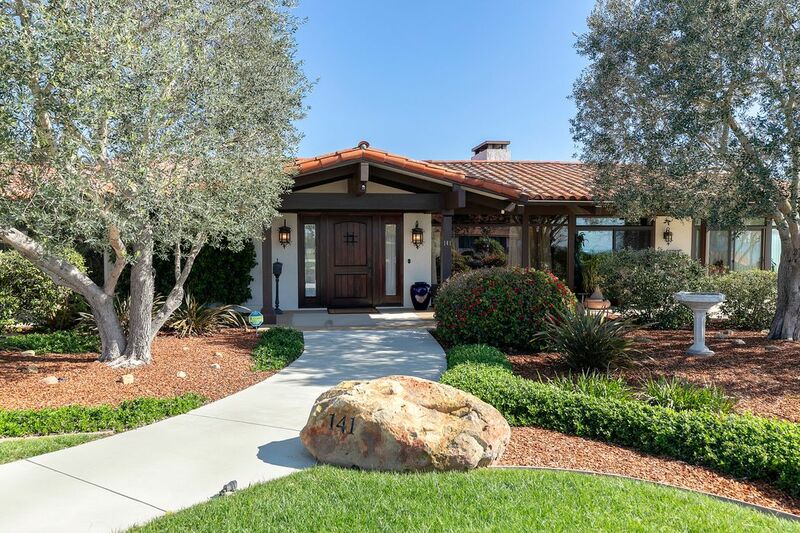 At the crest of the circle with its approximately 300-foot frontage, drought tolerant landscaping designed by Eric Nagelman, olive and Italian Cyprus trees, and a gracious walkway flanked by grass is 141. To the South are expansive ocean and channel-islands views. To the North are views of the San Ynez Mountains. Enter the house through a custom mahogany doorway, and to the right is a grand Santa Barbara sand stone fireplace, which is the focus of the Living Room with its thirteen-foot-high cathedral ceilings and Saltillo tile floors. 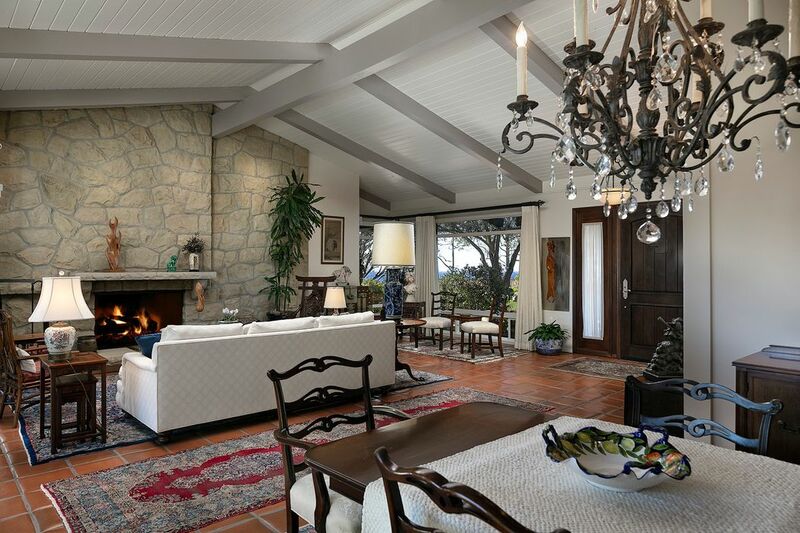 A bit to the left French Doors open to a Mediterranean court yard with a formal fountain and koi pond. Looking left once more is an open Dining Room, and beyond, the Kitchen with alder wood custom cabinetry, a center island with sink and hanging pot rack, granite counter tops, a moisture-controlled skylight, Viking stove, oven, and microwave, Bosch dishwasher, Subzero refrigerator and freezer, a large walk-in pantry, and views of the mountains. Outside the kitchen, a covered North patio equipped with two gas heaters is ideal for grilling and alfresco dining. 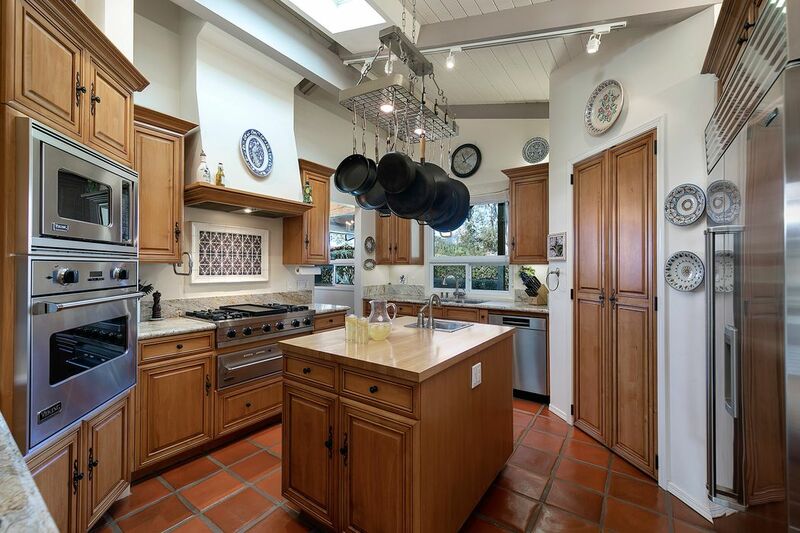 The kitchen leads to a Breakfast Room, then a Media Room with custom cabinetry and sliding pocket doors. 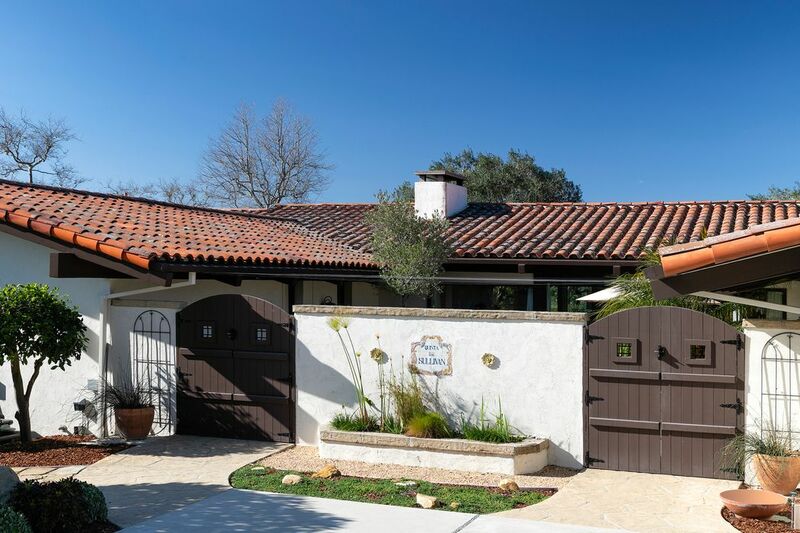 A hallway leading to the Garage has a Cloak Room, Powder Room, enclosed Utility area with Bosch washing machine and dryer, and a temperature-controlled 1,000+-bottle walk-in Wine Cellar. 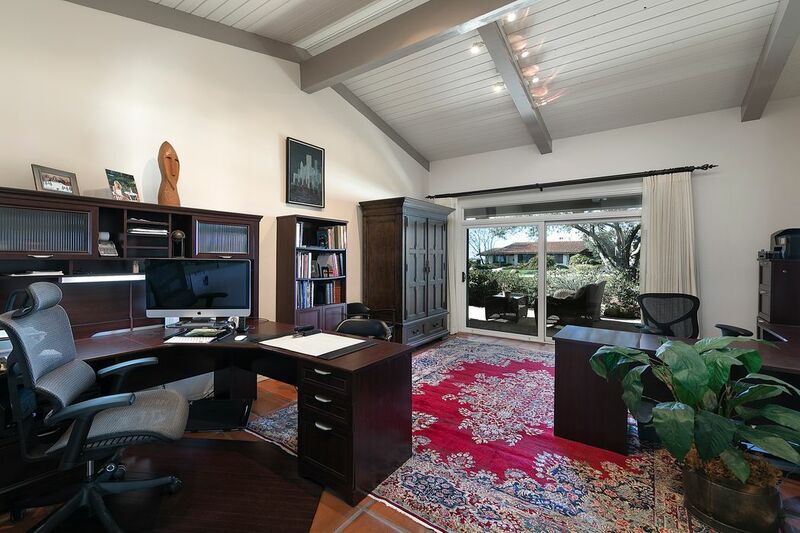 The South side of the house has an Office with room for two desks. Sliding glass doors lead to an outside patio. 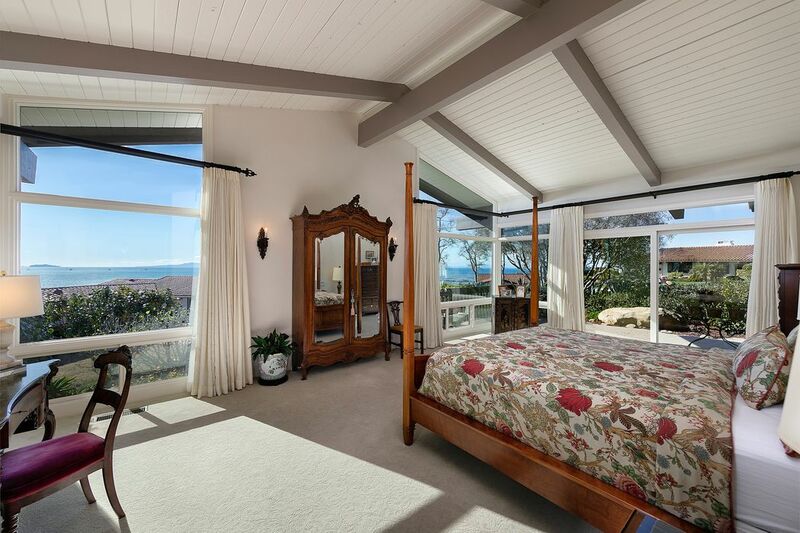 A very generous Master Bedroom has views of the harbor, ocean, and islands. 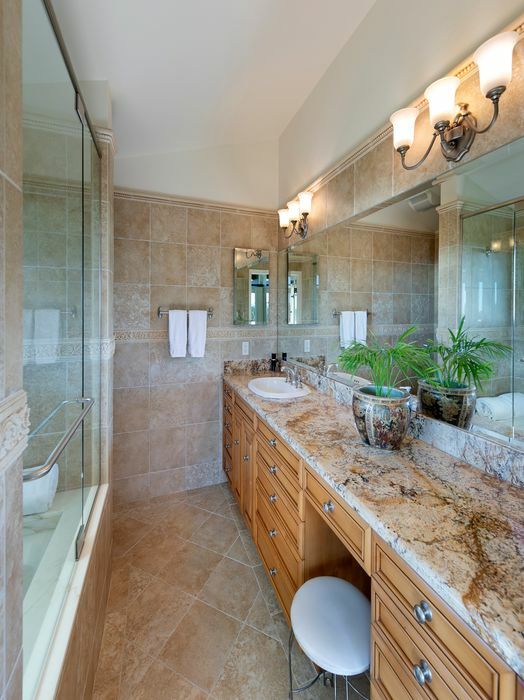 The fully tiled Master Bathroom with granite counter and custom cabinets has double sinks, a large glass enclosed shower, heated floor and instant on recirculating hot water. 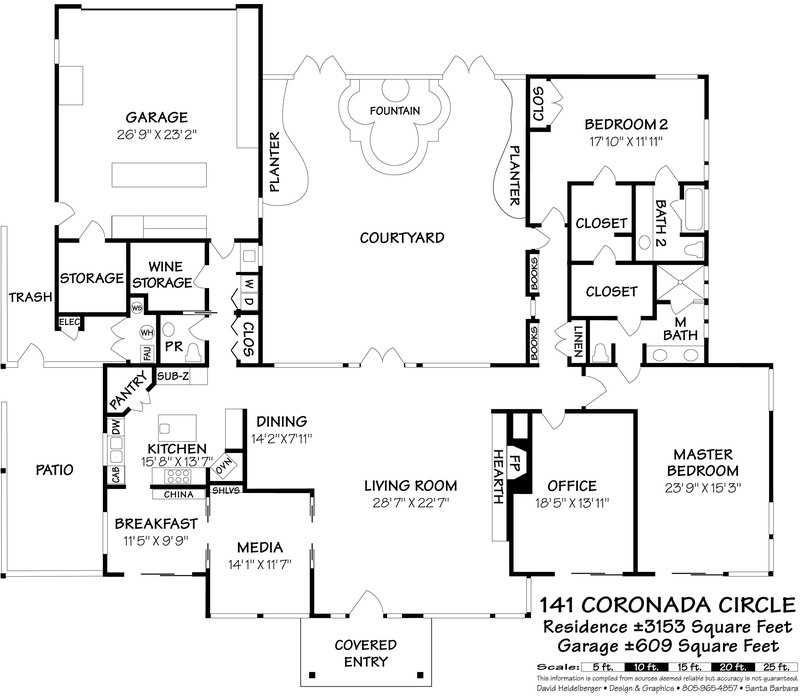 Two attached Walk-in Closets are accessed from the Master. 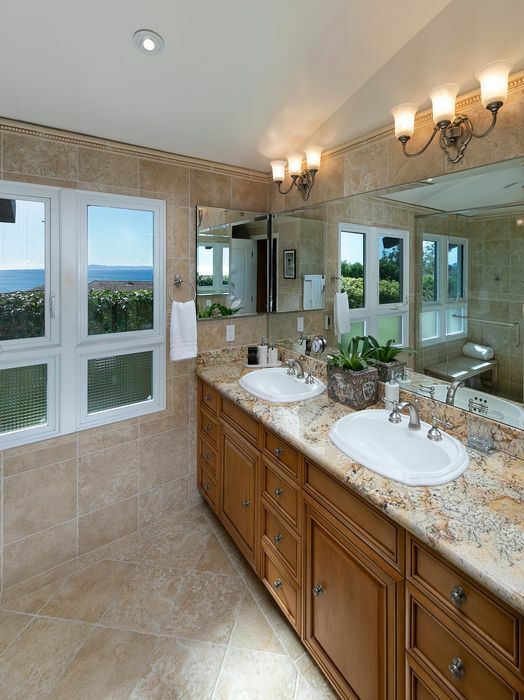 The second Bedroom with closet has views of the ocean, islands and the Montecito Valley, and a fully tiled Bathroom with granite counters, vanity, custom cabinets, built-in shower/tub, heated floor and instant-on recirculating hot water. An over-sized two-car Garage has approximately 500 square feet and is equipped with a “Garage Envy” workshop, shelf storage space behind sliding doors, and a secured, walk-in Storage Room. There is a large parking area outside the garage. Within the garage, there is a utility area for a Solar Power System with solar panels located on the garage roof. The homeowner completely owns the solar system; it is not under contract with a power company. 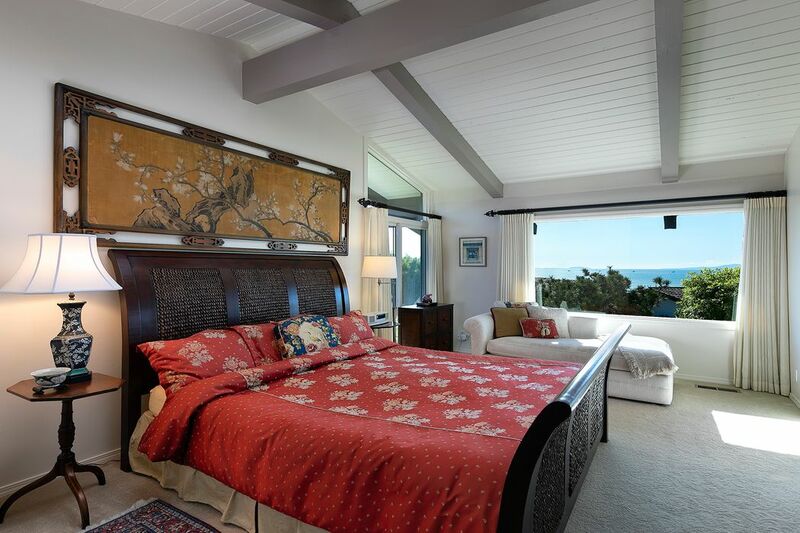 The house with 3,200 +/- square feet was beautifully remodeled in 2007. The North Garden area has an auto-fill Fountain with timer, three raised Planter Beds with attached watering systems and stepping stone pathways. Enjoy navel, Valencia, and mandarin oranges, plus lemons and limes from the garden’s citrus trees. The Garden area on the South side of the house is commonly called the “Rio Seco”. 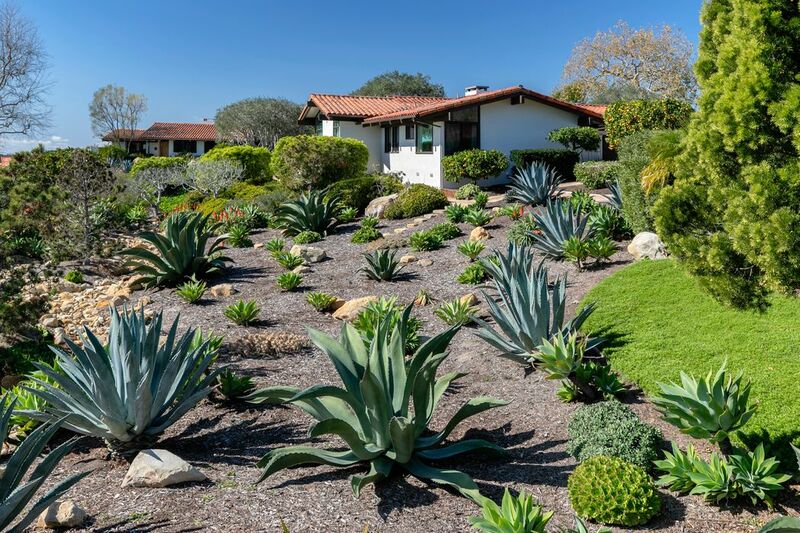 It is a large succulent garden that does not require water and is enhanced with a rock formed dry creek bed and black pine trees. Finally, sunrises and sunsets are often quite spectacular. A beautifully remodeled harbor view home in the quiet development of “Villa Coronada” with 2-bedrooms, each with full granite bathrooms, a den and office, top of the line kitchen and inviting patios all wonderfully remodeled and in excellent condition offering extensive amenities along with spectacular ocean, island and harbor views to the south and majestic, panoramic mountain views to the north. Far removed from the Montecito mudflow evacuation zone, one enters Coronada Circle, a quiet broad street with sidewalks and no through traffic. It is shaded by old sycamore trees while unobstructed by overhead utilities. The houses and landscaping are well maintained in Villa Coronada, a Planned Unit Development with a community pool. 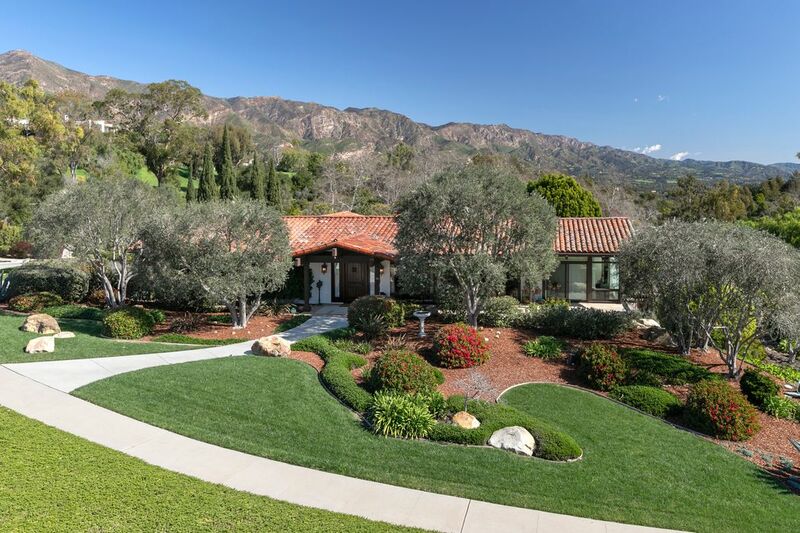 At the crest of the circle with its approximately 300-foot frontage, drought tolerant landscaping designed by Eric Nagelman, olive and Italian Cyprus trees, and a gracious walkway flanked by grass is 141. To the South are expansive ocean and channel-islands views. To the North are views of the San Ynez Mountains. Enter the house through a custom mahogany doorway, and to the right is a grand Santa Barbara sand stone fireplace, which is the focus of the Living Room with its thirteen-foot-high cathedral ceilings and Saltillo tile floors. 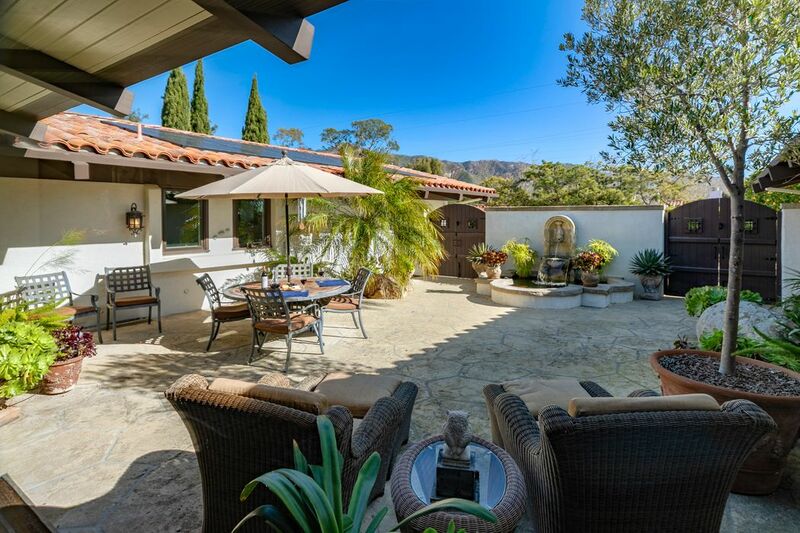 A bit to the left French Doors open to a Mediterranean court yard with a formal fountain and koi pond. Looking left once more is an open Dining Room, and beyond, the Kitchen with alder wood custom cabinetry, a center island with sink and hanging pot rack, granite counter tops, a moisture-controlled skylight, Viking stove, oven, and microwave, Bosch dishwasher, Subzero refrigerator and freezer, a large walk-in pantry, and views of the mountains. 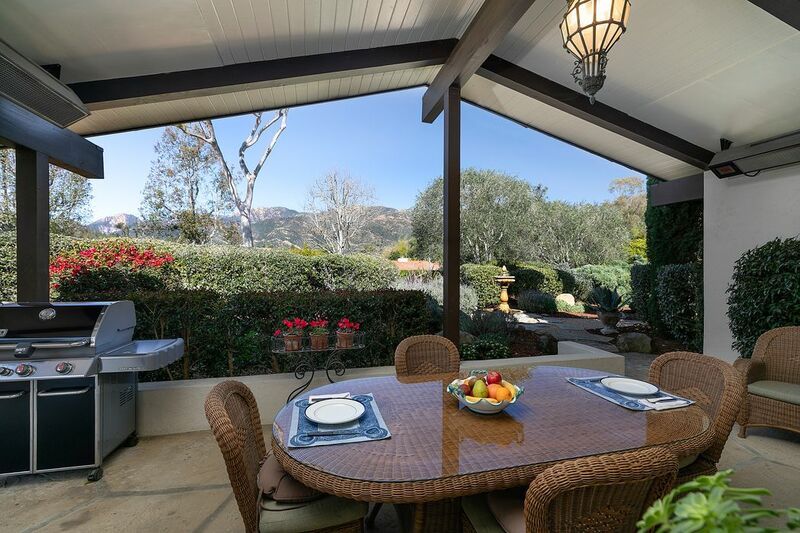 Outside the kitchen, a covered North patio equipped with two gas heaters is ideal for grilling and alfresco dining.